Sir Gawain and the Green Knight, is a fourteenth century poetic masterpiece. No mere Arthurian romance, it is a work of huge religious, spiritual and mystical power. In subjecting its hero to the hardest of temptations, it reveals the hollowness of the chivalric ideal, the weakness of men and the loneliness of the human condition. As well as its great literary merit, it also allegorical, carrying a profound message for contemporary kings and nobles. This summary is written for those unfamiliar with this wonderful poem and follows the conventional wisdom of dividing it into four fitts, or parts. He is unarmoured, and carries in one hand a holly bough, a symbol of peace, and in the other an enormous axe. Most strange of all is his colour: “enker grene” – his horse, body, clothes, hair, everything is green. In answer to Arthur’s indolent mood, he lays down a gruesome challenge: whoever can cut off his head with the great axe, can keep the axe as a prize … provided that he can return the favour in a year’s time and behead his assailant! The months pass, and Gawain prepares for his journey in the finest armour. His shield bears a golden star, each point representing five virtues of a perfect knight; on its reverse is an image of Mary to protect him. Setting off at Michaelmas, he crosses Britain, fighting dragons, beasts and wodwose (wild men of the forest) before taking the coastal road of North Wales and crossing into the Wirral. Eventually, seeking somewhere to celebrate Christmas, his prayers are answered and he arrives at a grand castle. Here, he meets a genial lord, his wife and a strange, older woman. Welcoming Gawain, the lord tells him that the Green Chapel is not far off so Gawain can rest for three days to recover before journeying onwards. Gawain is delighted and they agree to a Christmas game: the lord will go hunting on each of the three days while Gawain rests in the castle to be entertained by his wife. Whatever the lord captures on his hunt, he will exchange with Gawain’s winnings in the castle. Fitt 3 is in many ways the highlight of the poem. Three times, the lord goes hunting while his wife sneaks into Gawain’s room and attempts to seduce him. First, the lord captures a fine quarry of deer and returns with the butchered game as a gift for Gawain. All Gawain can offer in return is one kiss, received from the lord’s wife during an exchange of “luf-talking”, a form of flirtatious speaking about the meaning of love. On the second day, the lord captures a boar; in exchange, he receives the two kisses Gawain received from the lady. Finally, the lord hunts for Raynard, the fox. In parallel, the lady – like the fox attempting to outmanoeuvre the lord – tries to outwit Gawain’s defences but he still holds her off. He is tested to the very limit but still he does not surrender to her. Yet he accepts from her a green girdle so magical that it will protect any wearer from harm. When the lord returns, he gives Gawain the fox’s pelt; in return, Gawain gives him the three kisses he has received – but not the girdle. While Gawain may have resisted the wife’s sexual advances, he nonetheless is duplicitous in not confessing the girdle. Now Gawain travels to the nearby Green Chapel in the company of a guide. Like Christ in the wilderness, Gawain is tested yet again as the guide tries to dissuade him from going, saying he will tell no-one if Gawain turns back. 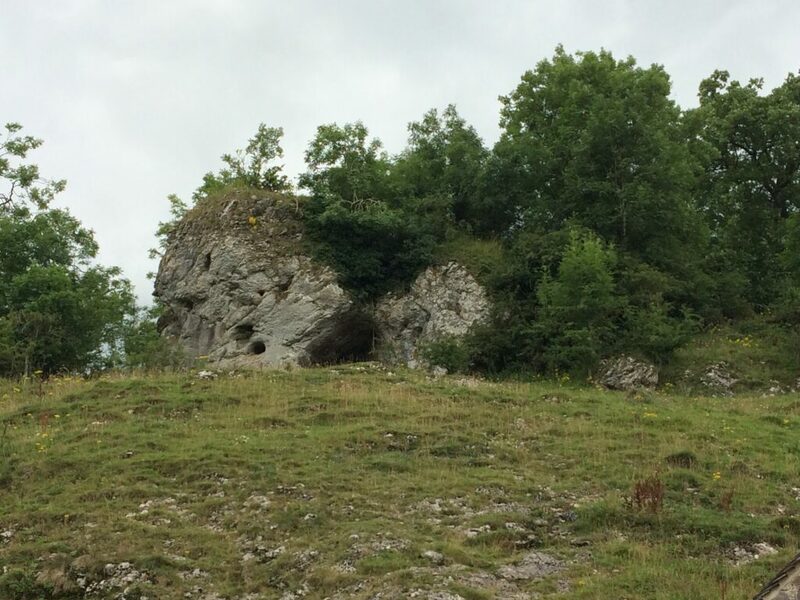 However, Gawain proceeds alone, to arrive at a valley where he finds the Chapel, “nobut an olde cave” in the words of the poet. Gawain climbs onto its roof, where he suddenly hears the sound of an axe blade being sharpened. It is now we meet again the ghoulish figure of the Green Knight, who descends from the rocks above, ready to execute our hero. Gawain is subjected to three blows from the axe. With the first blow, Gawain flinches out of the way. The Green Knight laughs with contempt so strikes again, this time stopping the blade in its descent to test Gawain’s bravery. Satisfied, he brings the blade down a third time but, instead of slicing off Gawain’s head, merely nicks him on the side. Alert, Gawain says he has received his due and rushes to grab his weapons, but the Green Knight laughs, telling him that this small blow is his punishment. He explains that each strike of his axe was for each day Gawain dallied with the lady — indeed his wife — and that he is in fact the castle’s lord, Bertilak. He has changed shape and colour on account of the old lady in the castle, revealed as the sorceress Morgan le Fay, Arthur’s half-sister. She set up the original challenge to frighten to death Guinevere (whom she detests). More, he tells Gawain that he knew all about the green girdle; indeed, he arranged the whole thing. Gawain is truly ashamed, being seen as a knight failed in his chivalric ideals and who trusts magic rather than God. 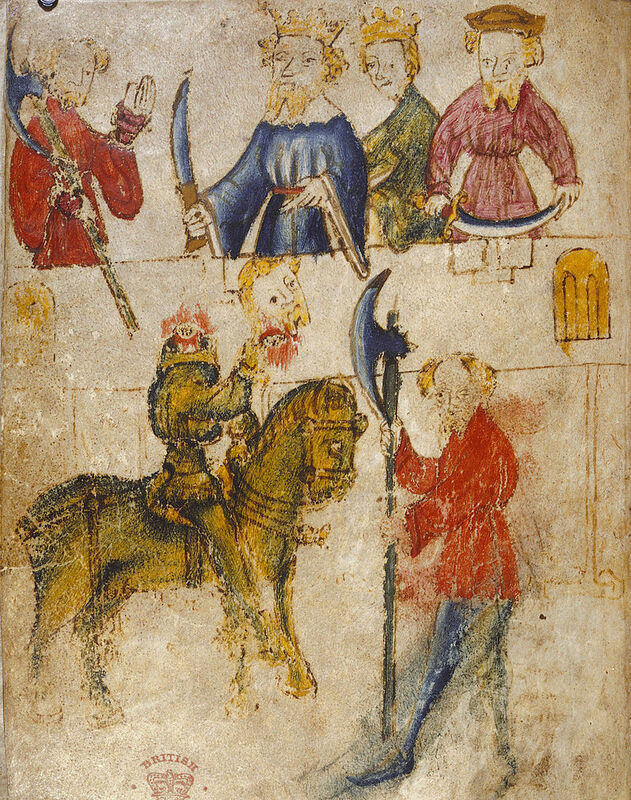 Although the Green Knight forgives him and invites him back to the castle (Hautdesert), Gawain refuses and instead returns to Camelot wearing the green girdle as a sash betokening of his shame. He is welcomed by Arthur, Guinevere, and the court and, despite his mortification at his shame, it is decreed that all the Round Table will in future wear a green sash in commemoration of this adventure. The poem ends with the motto of the Knights of the Garter, established by Edward III. 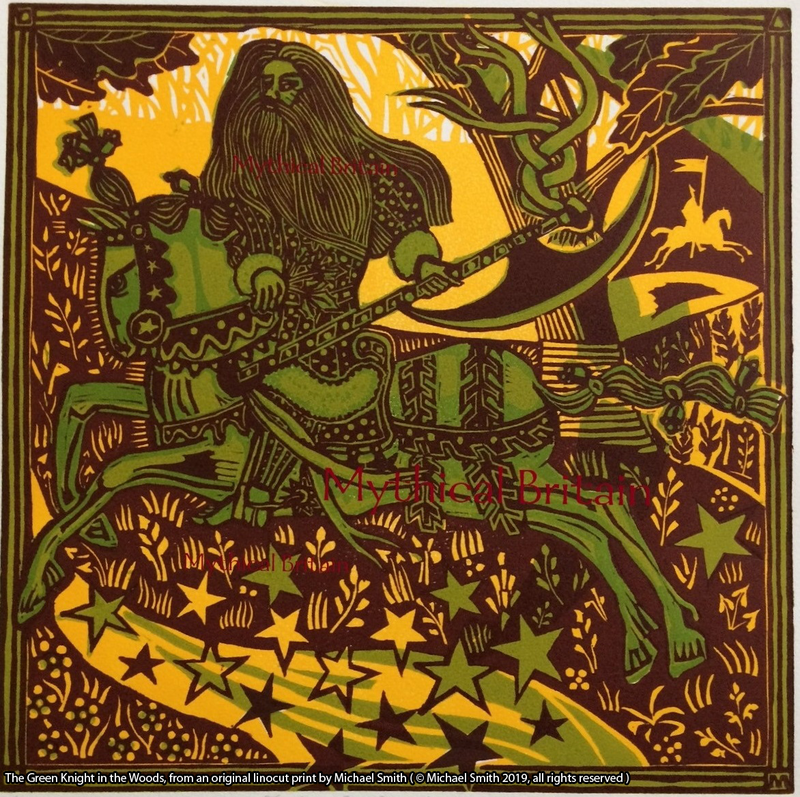 Sir Gawain and the Green Knight is a stunning alliterative poem which describes the frailty of the human condition; that pride comes before a fall. It addresses the need for faith when faced with the gravest temptations and disguises much of its philosophy as an Arthurian romance. Its references to the “surquedry” (overweening pride) of Arthur’s court also give an insight into a possible allegorical intention for the work. The reference to the motto of the Knights of the Garter, albeit added in a later hand, in some way hints at the intended purpose of this poem: the writings of a poet-mentor, intent on addressing the contemporary failings of Edward III or Richard II. It is a stunning masterpiece with significant relevance even today. The brilliant team at Unbound have offered a copy of Michael Smith’s fabulous new telling of this famous legend for a lucky #FolkloreThursday newsletter subscriber this month, with a copy also going to one of our Patrons*! 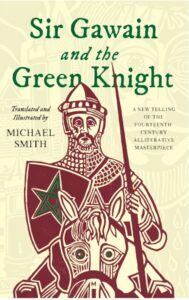 Michael Smith’s translation of this magnificent Arthurian romance draws on his intimate experience of the North West of England and his knowledge of mediaeval history, culture and architecture. 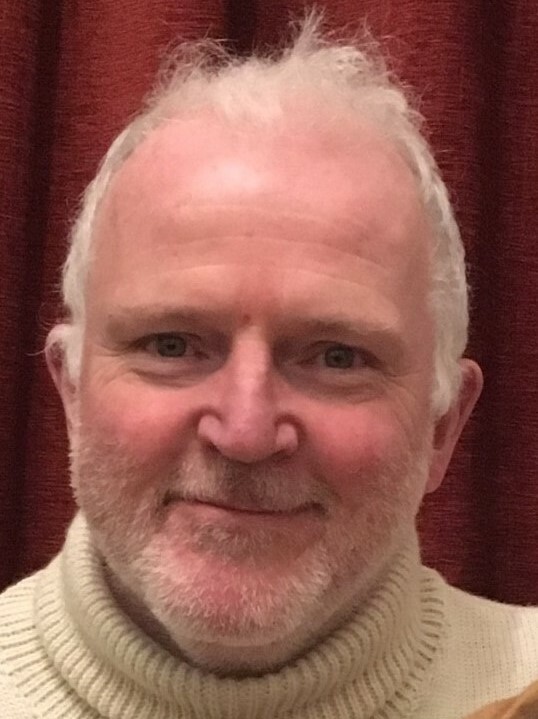 He takes us back to the original poetic form of the manuscript and brings it alive for a modern audience, while revealing the poem’s historic and literary context. Sign up for the #FolkloreThursday newsletter to enter (valid February 2019; UK & ROI only).